What’s the most terrifying situation you can imagine? Being slowly eaten by massive spiders as they ridicule you and expose your biggest flaws? Yeah, same, but I’m talking realistic fear. How about being involuntarily committed to a mental hospital when you’re totally sane? That’s what happens to Claire Foy’s Sawyer Valentini in Steven Soderbergh’s latest. Or at least she thinks she’s sane. In Unsane, which Soderbergh shot entirely on an iPhone, The Crown star plays an American, adopting some odd concoction of a Southern-meets-British-meets-I-dunno accent. She’s recently relocated to a new cubical job in Philadelphia to escape a stalker, but she’s haunted by visions of the creepy, soft-faced bearded guy (Joshua Leonard) she filed a restraining order against. Sawyer tries her best to pretend she’s moved on, but when her PTSD becomes unbearable, she seeks out a therapist at a mental health facility, Highland Creek. After a relieving chat with a counselor (Myra Lucretia Taylor), Sawyer decides to return for a second session next week, then unwittingly signs some papers that commit her to the asylum for 24 hours. That 24 hours turns into a full week once Sawyer meets a hospital orderly named George who she recognizes as her stalker, Leonard’s David Strine ... or does she? “Rationally, I know this is my neuroses colluding with my imagination,” Sawyer tells the therapist of seeing her stalker’s face pop up on strangers. Such a confident self-diagnosis, and even a willingness and commitment to recovery, is a pretty fine argument for being sound of mind; but all of that gets wiped away, of course, when you throw someone in a nuthouse. Locked up alongside a wacky Juno Temple with cornrows (I mean, of course) and other manic patients, Sawyer eventually befriends the most stable person there, recovering addict Nate (Jay Pharoah, who’s refreshingly good once you stop anticipating an Obama impression). But the more Sawyer violently lashes out and resists treatment, and the more her PTSD flares up, the more the staff at Highland Creek insist she belongs there, and slowly, we begin to as well. But Soderbergh’s film, co-written by Jonathan Bernstein and James Greer, isn’t interested in teasing out that mystery for long. This isn’t building to a classic Fight Club real versus imagined reveal, and thank god for it; we’ve been down that road oh so many times. Instead, Unsane gives away the goods, revealing whether or not Sawyer has indeed lost her mind. Usually that would tarnish a psychological thriller of this nature. But I’d argue it’s the biggest strength of the film, especially when held up against Soderbergh’s last disappointing foray into the genre. Before the filmmaker resurfaced from his big-screen retirement last summer with the delightful hillbilly heist Logan Lucky, 2013’s Side Effects was supposed to be his swan song. That thriller tried to impress audiences with narrative trickery; withholding buckets of information, then throwing one inane sucker-punch twist after another. Where Side Effects smugly unraveled its frustrating plot, Unsane lays all its cards out on the table. It opts for a relatively straightforward narrative and never aims to fool or mislead us. Once it gives you the missing pieces, Soderbergh begins to have fun, creating a visceral, claustrophobic nightmare about one woman’s will to survive, be heard, and overcome trauma, and he does it all exceptionally well with nothing but a cell phone. Similar to Sean Baker’s Tangerine, Unsane was shot entirely on three iPhone 7 Pluses, using a few attachment lenses, a couple $15 apps, and in the case of overhead shots, a drone camera. That low-rent style appropriately suits the film’s schlocky aesthetic, which Soderbergh introduces off the bat in the film’s opening – a wide shot from behind the bushes shakily follows Foy’s Sawyer as she crosses the street while chintzy, ’70s music plays. As soon as I heard the music, I giggled. This movie doesn’t take itself too seriously, and that’s part of why it works. Acting as his own cinematographer (and editor) as usual, Soderbergh creates an atmosphere of suffocating lunacy and inescapable paranoia that takes a few cues from Repulsion. The iPhone quality is what makes his movie especially unsettling – everything looks uncannily familiar. 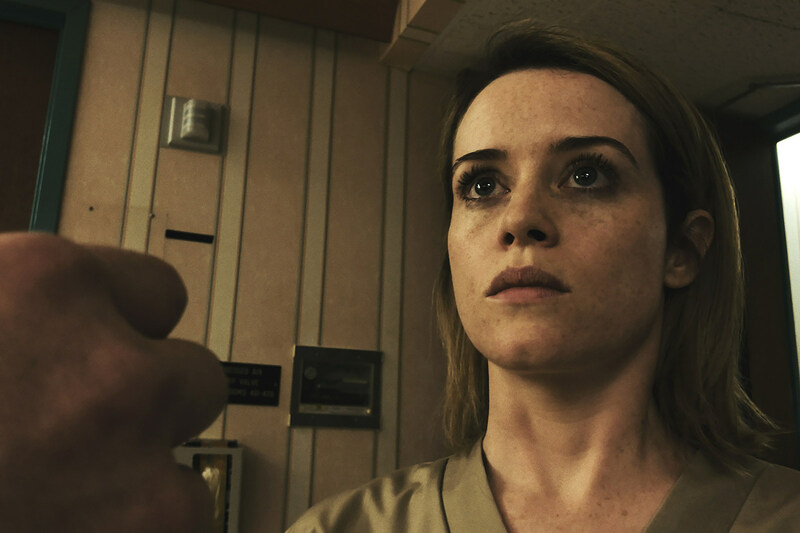 Unsane is filled with harsh, unforgiving lighting, with characters’ faces shrouded in patches of darkness, or overexposed by florescents. He has some fun with fish-eye lenses for distortion and superimposed images in one trippy, frantic sequence. That isn’t to say Unsane is perfect. There’s at least one major plot hole that crumbles the whole thing, and a couple big revelations are lazily introduced. Despite running a tight 98 minutes, the film begins to lose momentum near the end of the second act. There’s also a brief cameo from a major actor that’s cute until it proves pointless and gimmicky. But I’m nearly inclined to forgive most of that considering the fantastically nutty final 30 minutes when Soderbergh floors it to brutal, exhilarating extremes. Unsane is a lot of things. It’s a pulpy thrill ride that made me audibly gasp and jerk in my seat a few times. It’s a disturbing (not to mention timely) trip inside the mind of a woman being repeatedly gaslit, silenced, and used; an upsetting treatise on facing, instead of fleeing, one’s trauma; and a promising taste of Foy’s fiery talent when she gets to play outside period drama territory (a good sign for her Lisbeth Salander). But mostly, Unsane is Soderbergh’s horrifying reminder that, whenever you sign something, damn it, always read the fine print.